For decades, now, many, including much of the towing industry, have worked on the basis that, for safe towing, we should, always, aim to stick to a trailer or caravan that weighs no more than 85% of the kerb weight of the towing vehicle. Over and over again, we hear; Well. The Caravan & Motorhome Club recommend it, so it must be right, but what, exactly, does it mean? Is there any scientific basis behind it, and, if not, what factors are important, and what weights should we, actually, be using? Increasingly, trailer manufacturers are coming out and challenging the validity of the ‘85% rule’, and, it would appear, with good reason. There are, it seems, a number of inherent flaws in the Caravan & Motorhome Club recommendation. Some of them are genuine flaws, whilst others are more down to errors of interpretation, than anything. A classic example of the latter is that many quote 85% as the figure recommended for anyone towing. Of course, this is incorrect, and the clubs recommend up to 100% for anyone who is more experienced at towing. The 85% hypothetical figure is for those new to towing, only, and, also, relates only to caravans, due, in the main, to their unique towing characteristics. Another very common misconception is that the 85% is law, and must not be exceeded, under any circumstances. This is not true, and never has been. Indeed, and, more worryingly, some cars have a legal towing capacity that is, actually, lower than 85% of kerb weight, meaning that, using the latter, will, actually, render the driver illegal. Whilst most are aware that the 85% is not a legal figure, there is a much more widespread belief that 100% is a legal limit. This is not, entirely, surprising. At the time of writing this, the web sites of the Caravan and Motorhome Club, Camping & Caravanning Club, National Trailer & Towing Association*, UK Tow, and just about every professional source I can find, clearly state that, on a post 1997 licence, the MAM of the trailer / caravan cannot exceed the kerb weight of the towing vehicle. This is completely incorrect, but, to date, only the Camping and Caravanning Club have made a partial correction, on one part of their web site. The truth of the matter is that, from a purely legal perspective, there is no problem with towing a trailer or caravan that is in excess of the kerb weight of the towing vehicle, even on a standard B licence (provided it is, also, within both the physical towing capacity of the car, and the licence parameters of the driver). Government sources did, originally, state that, on a post 1997 licence, trailer MAM could not exceed vehicle kerb weight, but this is no longer the case, and has been removed from all official Government sources (although not, it would appear, the majority of other industry sources). The 85% Guide (we will refer to it, as that, for now, as that is the term that is familiar to most) was conceived decades ago, before manufacturers, actually, specified an official braked towing limit for their vehicles. It was, also, put in place prior to the introduction of a significant number of technological developments, both in terms of vehicle, and trailer manufacture. We have seen significant advancements in things like suspension and brake design, ABS, ATC, stabiliser hitches etc. Towing, as a whole, is a lot safer than it was 30 or 40 years ago, provided we are mindful of other key factors, such as speed, loading, driving style etc. Unfortunately, there has been no change in the recommended safe towing limit, since the mid 80’s, in order to compensate for this. The guide was, originally, introduced, in order to provide a measure by which those new to towing could gauge what was a safe figure to tow, with their chosen vehicle. Again, there are a huge amount of misconceptions as to why this was necessary. These range from; “it needs to be lighter, so that the car can brake more easily” to; “It needs to be lighter, so the car can pull it”. The facts, however, are that a heavier car, relative to trailer, is preferable, as it is, generally, believed it helps to control any snaking that might occur. Caravans have very different handling characteristics, from other trailers. They are high sided, non aerodynamic boxes, with high centres of gravity, and low internal density. This means they are more prone to snaking, caused by cross winds, overtaking lorries, etc, than other trailers. If this happens, then the theory is, that a heavier car, relative to the caravan, will help to prevent the ‘tail wagging the dog’. There is, of course, an element of common sense in this, however, in the modern world, with all the technological advances listed above, a correctly loaded caravan, with the right tyre pressures travelling within the speed limit, is far less likely to experience issues than it would have done thirty years ago. Of course, that is not, in any way, to suggest that it cannot happen, simply that the risks which were around when the guide was devised, are, now, significantly reduced. This, in my personal opinion, is where the 85% guide really falls down, as it takes no account, whatsoever, of actual weights involved. Contrary to popular misconception, you do not apply the 85% to vehicle towing capacity, or gross weight. You apply it to kerb weight. So, we take the maximum gross weight of the caravan, and compare it to the kerb weight of the car. That can give rise to some rather ridiculous inconsistencies. Let’s take a look at one, potential, scenario. A caravan has a net weight of 1,500kg and a gross weight of 1,700kg. The C&MC rule takes the maximum gross weight of the caravan, and compares it to the kerb weight of the car. In this case, gross weight of caravan / kerb weight of car equals 1,700kg / 1,600kg, which equates to a towing ratio of 106%. This would be rejected, out of hand, as a bad match, by our friends at C&MC. OK, but that assumes the caravan is full, and the car is empty. So, what if it is the other way around? Net weight of caravan / gross weight of car equals 1,500kg / 2,200kg which works out to 68%. Clearly, these are two completely different scenarios, however, according to the C&MC, they are EXACTLY THE SAME! Really? Of course, it is unlikely you will ever be travelling with a car that is fully loaded, towing a caravan that is completely empty, but is that, really, any less realistic than the C&MC version of towing a fully loaded caravan with a totally empty car? I suspect not. Just for the purposes of comparison, let’s assume that both the car and the caravan are loaded to 50% capacity. The calculation, then, becomes 1,600kg / 1,900kg, or 84%. Ooh. Good. Spot on then. Again, all hypothetical, but it does expose the inconsistencies in the theory, and pushes it, still, further, into the realms of; ‘myth’. Another way of looking at this is to take the example of a couple of potential tow cars. The Renault Grand Scenic 2 Litre and the Land Rover Defender have an almost identical kerb weight. The latter has a type approved towing limit of 3,500kg. That of the Renault is 1,300kg which, as it happens, is, almost 300kg less than 85% of kerb weight. In spite of this, the 85% Guide would have us believe that these two cars are equally competent at towing a caravan. Whilst I would not, for one second, advocate the towing of a three and a half tonne caravan with the Land Rover, it does, once again, highlight the potential issues with the guide. OK, so it appears that the C&MC guideline is both outdated, and riddled with inconsistencies, but what do we use, instead? I guess the simple answer is; a mixture of manufacturers’ towing limits and common sense. Another of the many misconceptions surrounding towing weights is that the manufacturers’ specified towing capacity, simply, represents the amount the car can tow up a 12% incline. This is not the case. That is, indeed, a factor, but these figures are the maximum amount we can legally tow. It is naive, in the extreme, to assume this is based, purely, on what it can tow up a predetermined gradient, with no recourse to suspension, braking capabilities etc. The manufacturers’ braked towing limit is the amount the vehicle can legally and safely tow, taking due consideration of engine capabilities, suspension, brakes etc. That said, we would be foolish to completely ignore the unique challenges afforded by towing a caravan, if, indeed, that is our accommodation of choice, and, in most cases, the ‘happy medium’ is, as you would expect, likely to be found somewhere in between the C&MC guideline, and the manufacturers’ specified towing limit. How Do Towing Capacities Work, And What Can We Tow? The commonly held belief is that we can tow, up to the limit specified on the car’s VIN plate. This is, to a large extent, true, however, it is a little more involved than that. A typical VIN plate will include four weights (see below). The top weight represents the maximum allowed gross weight of the car. The second weight is the maximum gross weight of car plus trailer (Gross Combination Weight). The last two weights are the maximum allowed load on each axle. It is a widely held belief that the difference between lines one and two is the maximum amount the car can tow. In the case of the plate, above, this would be 1,695kg (4,200kg – 2,505kg). In some cases, this may well be the case, however, what this, actually, represents is the maximum amount the car can tow, when it is, itself, fully loaded. It is, perfectly, possible, that the actual towing capacity could, in fact, be more, and, often, the V5 will show a higher figure. The only thing that is legally enforceable, in UK law, is the Gross Combination Weight. Provided this is not exceeded, you will be towing within the law. Hence, in the example above, if the car were only loaded to 2,305kg (under loaded by 200kg) then the trailer could, theoretically, be loaded to 1,895kg, and still remain within the required Gross Combination Weight. Just as a point of caution, though; the Department For Transport Guide To Towing With A Car does advise that exceeding the amounts on the VIN plate / V5 “…is likely to be construed as using a vehicle in a dangerous condition”. So, legally, we are covered, as long as we are within Gross Combination Weight, however, if we abuse that too much, it could go against us, so it’s always best to remain within the limits of the VIN plate / V5 wherever possible. Also worth pointing out, at this stage, that, whilst driving licence restrictions** (where applicable) work on plated maximum weights, vehicle towing limits are based on actual weights, so, in this example, provided the actual weight of car plus trailer does not exceed 4,200kg, it will be legal. There is absolutely no doubt we should, always, take whatever steps we can, in order to ensure we are driving / towing both safely and legally, and driving with an appropriate weight ratio is an important part of this, of that, there is no doubt. The question, here, is what, if any, place the 85% guideline has in this equation, in the modern world. All of these will help to minimise the risk of the kind of snaking the 85% guide was introduced to help us control. (A case of prevention being better than cure). The important thing is to apply common sense (something the guide fails to do, as it doesn’t address actual weights of car and caravan, only kerb weight of car and gross weight of caravan). Rather than blindly following an outdated, and, largely, illogical, guide, common sense dictates we look at what both car and trailer, actually, weigh and work on that ratio. Obviously, the heavier the car, relative to the trailer, the better, but let’s keep things realistic, when working out what we can, and cannot tow. * Since writing this, the NTTA have responded, as follows, although, as of August 2017, they have, yet, to update their web site. Thank you for taking the trouble to point out the inconsistent answer on our FAQs page. I am inclined to agree with you, especially as the confusion relating to kerb weights was withdrawn by DVLA earlier this year. There was a kerb weight restriction that applied to those drivers who passed their driving test after 01/01/1997 but confusingly, this did not apply to those who gained their licence on or after 19th January 2013 as the EU Third Driving licence Directive 2006/126/EC was implemented. DVLA agreed to make this the basis for all licences so things are now more simple. The 85% figure is a recommendation, not a legal limit, given by caravan clubs to give good power to weight ratio for successful towing. The recommendation is aimed especially at those inexperienced in towing. You may legally tow up to the car manufacturer’s towing limit as ascertained from the vehicle’s type or chassis plate (see the first question, above). Does this make more sense? We will be reviewing our advice items as we revise our website in the course of the next few months. I expect that we will need to change a number of points that are a little out of date. ** For full details on licence restrictions, and all other key aspects of towing legislation, check out our earlier article; The Layman’s Guide To Towing In The UK. Upper Lynstone Caravan & Camping Park is a smallish, 4 star, family run camp site, a five to ten minute walk outside of the North Cornish coastal town of Bude. Its elevated position gives it excellent views, and it is just a stone’s throw from the coastal path, which offers, amongst other things, a more scenic walk into Bude, itself. 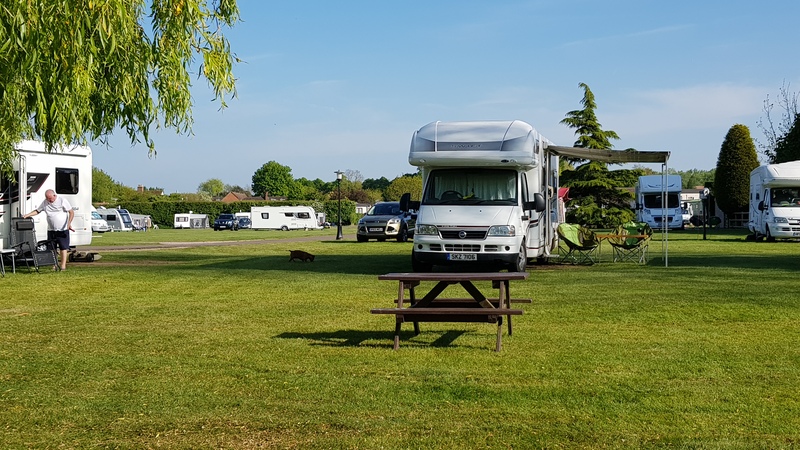 The site takes pretty much any type of unit, including tents, trailer tents, folding campers, caravans and motorhomes, making it an ideal location for larger family groups to meet up and share one site, regardless of the accommodation they are bringing with them. The site, also, offers a number of static caravans, which can be booked directly with the site. The site, currently, offers approximately 40 pitches, with 10Amp electric hookup, plus a similar number of non EHU camping pitches, some of which are pre bookable. The site is sloping, but those pitches that aren’t on level ground have been terraced, to ensure that, wherever you are on the site, sloping ground will not be an issue. The pitches are, in the main, separated by very low wooden fences, and are a minimum of 11 metres wide, which is pretty impressive, for a site of this size. All are grassed, with no hard standings that I am aware of. The main camping field is somewhat less formal, offering a number of open plan camping pitches. There is one main facilities block, but there is a second, smaller one, close to the main reception, where the recycling area and laundry facilities are, also, located, as is the shop and children’s play area. The facilities are modern, and clean, and more than adequate, for a site of this size. What was particularly impressive was the attention to detail, and some of the little touches, such as cloths to wipe down the sinks, in the wash room areas, drainer racks in the dish washing areas and hand gel at the chemical toilet emptying point. Upper Lynstone Caravan & Camping Park is situated on the Lynstone Road, approximately half a mile outside of Bude. The site is approached via a short driveway, with the reception, shop, and, presumably, owners accommodation directly ahead. This is very picturesque, with the main accommodation being a typical, if rather large, chocolate box cottage, with thatched roof. Inside the main reception area, there is, also, a small shop. Whilst this is rather diminutive in size, it has a reasonable array of products, for its size, including both the basic food produce items (bacon, eggs, milk etc) and the key camping essentials, in case of emergencies. There are, also, a number of non essential items, such as a rather tempting ice cream freezer. A freezer pack service is also provided, as is a phone / mobile device charging service, both at a small charge. The site does have wi-fi, although this is not compatible with some of the more high usage streaming sites. Having checked in, we drove past the children’s play area, recycling area and laundry room, through the small selection of statics, and up into the main camping fields. As already mentioned, the pitches were large, level and with both excellent views, and EHU. The toilet block is commensurate with the size of the site, with around half a dozen showers in both male and female facilities. These areas were extremely well maintained, and very clean. Hair dryers were, also, provided, if required. As is the way, with many camp sites, these days, showers are a push button affair, with no temperature adjustment. No great issue, normally, except we happened to be visiting in the hottest June for 40 years, so the ability to turn the temperature down, just a touch, would have been more than welcome (especially with my own, customary, sun burn). Other than that, it really is difficult to fault the toilet / shower facilities provided, especially in such a small, family run site. Washing up facilities consisted of a couple of sinks in the main facilities block, and a couple more in the laundry area. Again, about right for the size of site, and the plastic drainers provided were a nice touch, surprisingly lacking in many sites. The chemical toilet emptying point, likewise, was very modern and the addition of a hand gel dispenser on the wall did not go unnoticed. A simple, but often lacking, touch. Away from the main facilities block, near to reception, is the laundry area / second washing up area. This, also, doubled as an additional information room, with a large array of brochures and flyers for local attractions and events. Immediately opposite the laundry room is the children’s play area. This is a very respectable feature, for the size of site, and set in front of some pretty impressive views. Bude, itself, is a lovely town, with a great beach, plenty of pubs and eateries, and a decent array of shops and super markets. The main beach, also, features an outdoor tidal sea pool, which is a bit of a tourist attraction in its own right. A 10 minute, max, walk into Bude, brings you to the canal and harbour area, with car parks and a number of pubs and eateries, including the Brendon Arms, Falcon Hotel and the Olive Tree Restaurant. A further two minute walk along the wharf brings you to the main beach, with sea pool, traditional beach huts, and highly recommended ‘Life’s a Beach’ Bistro / Restaurant. Behind the beach is the main town, with its selection of shops, cafes and super markets. Plenty to see and do here, even when the weather isn’t the greatest. Dogs are welcomed on the site, at a small additional cost. There are no specific dog facilities on site, but almost unlimited walking options just outside. Upper Lynstone is an excellent little site, in an exceptional location. Facilities are modern, and well maintained, and pitches are large, level and with, in the main, excellent views. Cost of an average pitch, with EHU, ranges from £18 to £25, depending on the season. Awnings and dogs, again, depending on season, range from £1 to £2. What I loved about this site is that it is the best of both worlds. Family friendly, but without hundreds of kids running around. Well maintained but without too many rules and regulations. Large enough to have a bit of atmosphere, and all the facilities you could need, but small enough to provide a relaxing and welcoming stay. Local facilities, in Bude, are excellent, with plenty to see and do. All in all, the whole package makes for a very enjoyable experience, and one we will be looking forward to repeating in the forseeable future. To take a look at the main Upper Lynstone web site, click Here. For details of pricing and booking, click Here. In our earlier article; The Layman’s Guide To Towing In The UK, one of the items covered was that of the legal requirement (or not) of fitting extended mirrors, when towing, however, towing mirrors, as a topic, is, along with licences and towing weights, possibly, one of the most heavily debated topics on the internet, and it is clear that a significant percentage of those commenting, actually, have no idea as to what the law, really, is. In view of this, I thought it was worth looking at the topic of mirrors, as an issue, in its own right, to clarify exactly where we stand on them, when towing. By far the most common myth we are, currently, hearing, is; “The law has changed now. You must always fit extended mirrors when towing. They are now a legal requirement”. This is, in actual fact, not true. The law, simply states that we must have the prescribed rear view. This view is defined as an area that is 4 metres out from the side of the vehicle, at a distance of 20 metres back, as shown on the diagram below. Indeed, if we already have that required field of vision, then, in all likelihood, fitting extended mirrors will, actually, render us illegal. “You must have an adequate view of the road behind you. Fit suitable towing mirrors if your trailer or caravan is wider than the rear of your car”. Anyone familiar with the likes of the Highway Code will know that use of the word ‘must’, in this context, means a statement is law, as opposed to recommendation. As the site, clearly, states; “you must have an adequate view”, that is the legal requirement, not the fitting of towing mirrors. The site then goes on to say that you should fit suitable mirrors, if your trailer or caravan is wider than the rear of your car. In most cases, if the caravan or trailer is wider, then towing mirrors will be required, in order to achieve the legally required rear view. Another worrying thing we hear, on an, almost daily basis, is; “You may as well fit them, even if you don’t need them, just to be safe”. This is extremely poor advice. Whilst the vast majority of us will, indeed, need mirrors when towing, as mentioned above, fitting them when not required will, actually, render us illegal. OK, so why is that? It is all to do with not allowing the mirrors to protrude too far beyond the side of the vehicle / trailer combination. Ok, so, in layman’s terms; if a mirror is less than 2 metres above the ground, it is not allowed to protrude more than 20cm* beyond the side of the trailer / caravan, so as not to provide a further obstruction, and cause damage or injury to persons or property. This is, also, the reason why we are not allowed to use towing mirrors, when we aren’t, actually, towing, as this would mean the mirrors were, automatically, extending beyond the allowed limit. Also just worth mentioning that, if the car was registered after 26th January 2010, extendable mirrors must be E-marked to show that they comply with EU safety regulations. Failure to comply with the law, on towing mirrors, is not cheap. Whilst fines can be as little as £50, the maximum allowed penalty for non compliance is £1,000, and three points PER MIRROR. This is why many advocate ‘caution’ and suggest fitting them, when they aren’t required, however, as already stated, that, too, can be an offence, if they aren’t necessary. OK, so the vast majority of us will need towing mirrors, if what we are towing is wider than the rear of our car. For some, however, especially those towing with larger, commercial vehicles, or towing smaller trailers, such as some of the smaller 4 berth folding campers, towing mirrors will not be required, as we will, already, have the required rear view, and fitting them will, actually, render us illegal. As with many aspects of the law, it is not a case of ‘one size fits all’. We need to understand the basic principles of the legislation, so we can best apply it to our own, individual, towing situation. 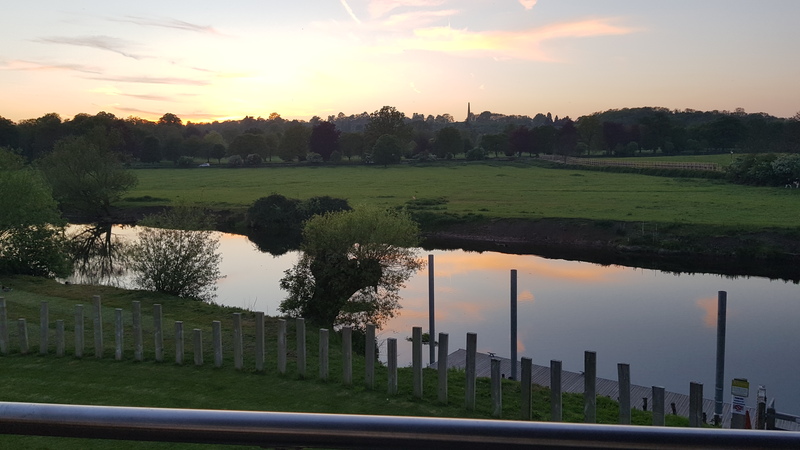 Riverside Caravan Park can be found about a mile out of the centre of Stratford, itself, and is situated right on the banks of the River Avon. 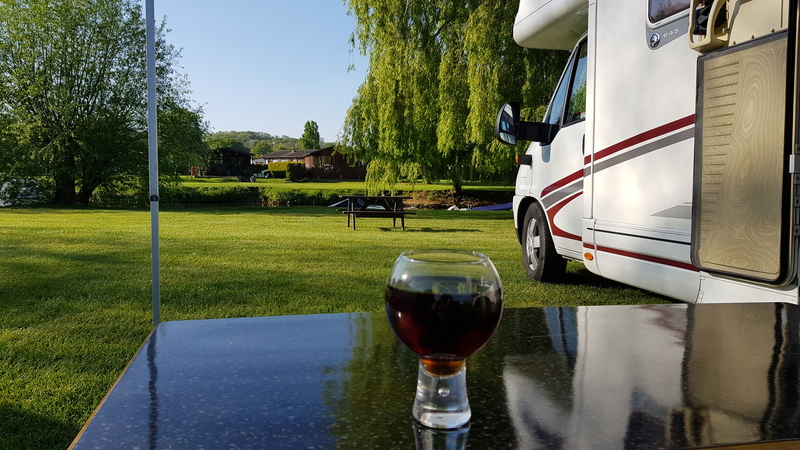 The site takes all types of caravans, motorhomes and folding campers, and also provides it’s own glamping pods, wooden lodges and static caravans, as well as having a separate residential park homes area. It does not accommodate tents or trailer tents. Pitches, Although Not Segregated, Have Plenty Of Space Between Them. The site has approximately 100 touring pitches, all with electric hookup. A small number of river side pitches are, also, available, at a small premium. The pitches are set out over two or three main areas, and are not segregated in any way, from each other, although spacing between pitches was more than adequate. The site has one, well maintained, shower & toilet block. 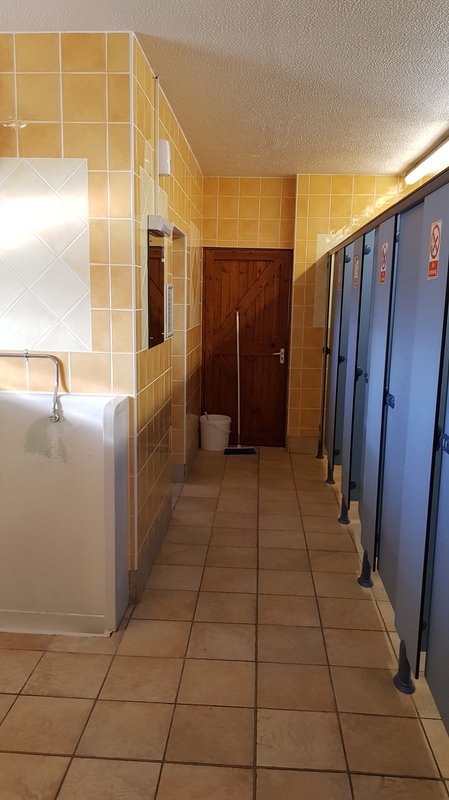 This contains all major amenities, you would expect, including fresh water, grey water disposal, chemical toilet emptying point and motorhome emptying point. There is a laundry room, and washing up facilities, as you would expect, with a site of this quality. The jewel in the crown for this site is the on site bar / restaurant, which also provides conference and wedding / private function facilities. Below this is a themed children’s play area, and crazy golf course. 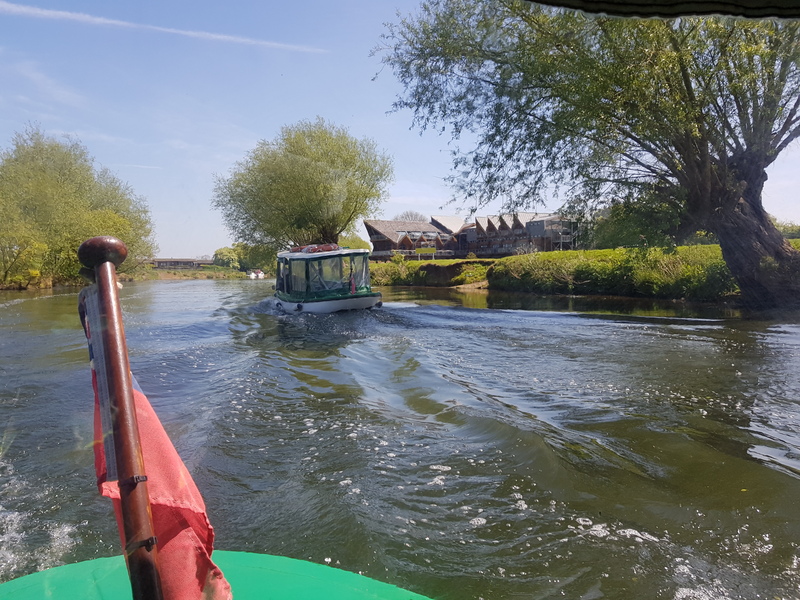 The site, also, provides a water taxi to the centre of Stratford. Not only does this perform an essential function, it is, actually, an attraction in its own right, and is definitely recommended. The site is situated about a mile out of Stratford, on the Tiddington Road, just before you get to the village of Tiddington, itself. It is approached via a long driveway, at the end of which is the main reception building. We arrived a little late, so we pulled up to the late arrivals area, and were shown to our pitch by a warden, and asked to pop in to reception the next day, to book in, properly, and pay the balance of our account. The Outlook From One Of The Small Number Of River Side Pitches Is Definitely Worth The Small Premium. Even Picnic Tables Are Provided. We paid a little extra for a river side pitch, and I have to say, it was well worth it. The location was gorgeous. Every pitch we saw appeared to be very level, and all included their own electric hookup. Just 5 minutes walk from the site entrance is the village of Tiddington, which incorporates a post office, convenience store, pub, Chinese and Indian restaurants (both offering a takeaway service) and a tapas bar. I can’t comment on the quality of these, as, in the three days we were at the site, we never had the need to wander outside its perimeter (other than the daily river taxi ride into Stratford). The toilet / washroom facilities are a little dated in terms of decor, and could probably do with a bit of an update, from that perspective, however, they were clean, well maintained, and feature under floor heating, for added comfort. Many of the showers were in separate rooms, with their own wash basin, chair, etc, so everything you need to get ready for a day or night out, in one convenient place. One shower room even had a toilet in there, as opposed to a sink, which was a little unusual, but still plenty of space in there. There is, also, a separate disabled washroom, with easy access for those with their own RADAR key. 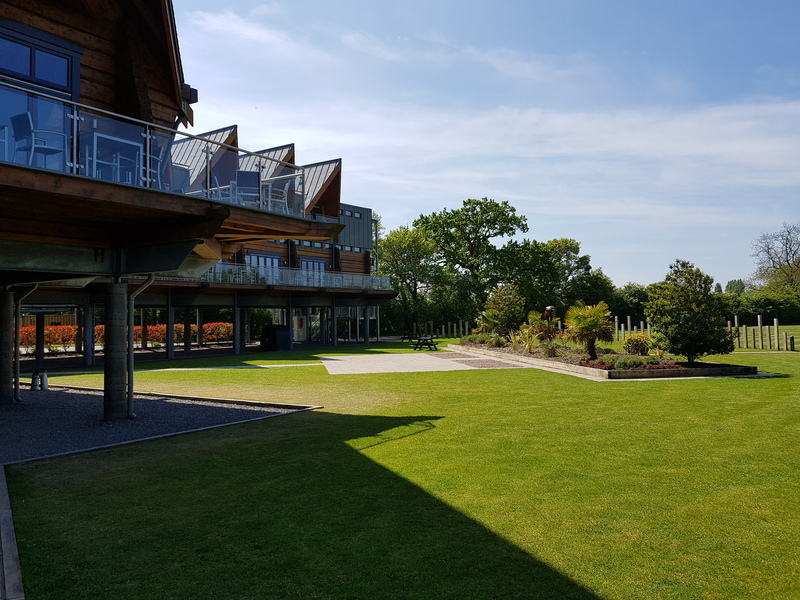 On the edge of the site, and adjacent to the River Avon is the Riverside Bar, Restaurant & Function Rooms. This is a very new addition to the park, and, at the time of writing, is still not showing on Google Maps. It is a very contemporary design, and its elevated position, whilst designed to avoid flooding, also provides an excellent vantage point to relax with a drink, and enjoy the view. Whether You Are Enjoying A Cup Of Something Hot, Or A Glass Of The Cold Stuff, This Is An Exceptional Place To Do So. Below the building is the crazy golf course, and, to the side, the themed children’s play area. 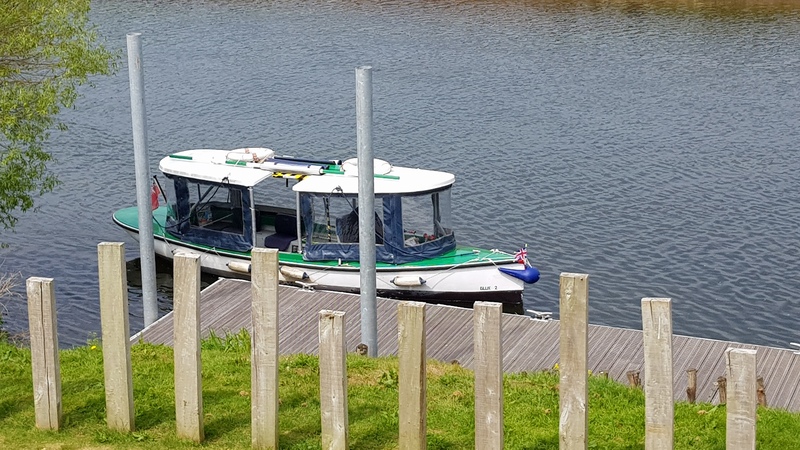 A few feet from the building is the jetty, which is used by the site run river taxi service. This service runs from 10am until 5.20pm and, at £2 per person, is the ideal way to make your way into Stratford, itself. There are two river taxis (three at peak times) running at 20 – 30 minute intervals. The journey is 10 – 15 minutes long, and the taxi can carry up to 6 passengers (including dogs, who are a common sight on there). 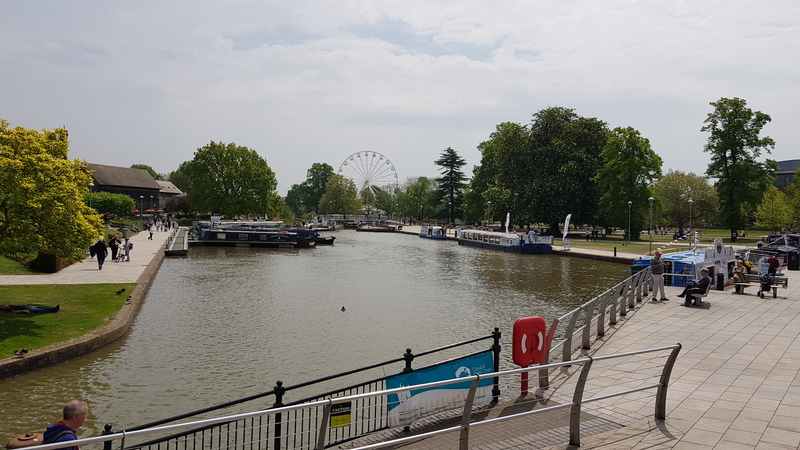 Stratford, itself, is a great day out, with shops, bars and restaurants, and, of course, the many and varied tourist attractions, both Shakespeare oriented and others. Only living 12 miles from the town, we didn’t make too much of the attractions, but we still travelled in, daily, on the water taxi, for something to eat, and to stock up on supplies from the shops. On of the many reasons for choosing this site (and one of the many reasons we will be returning) was the Riverside Bar & Restaurant. It has to be said, the menu was not the most imaginative in the world, especially when you consider the quality of the surroundings, but there are more than enough options to choose from, and the quality of both the food and the service, when we were there, was excellent. To check out the current menu and specials menus, take a look here. Canine visitors to the site are, also, well catered for. Dogs are welcome (up to 2 per pitch), there is a dedicated walking area, and plenty of poop bins / poop bag dispensers dotted around the site. When we were there, there was one dog to our right, two to our left, and two cats on the pitch behind. As mentioned above, well behaved dogs are, also, welcomed on the river taxi, as well. 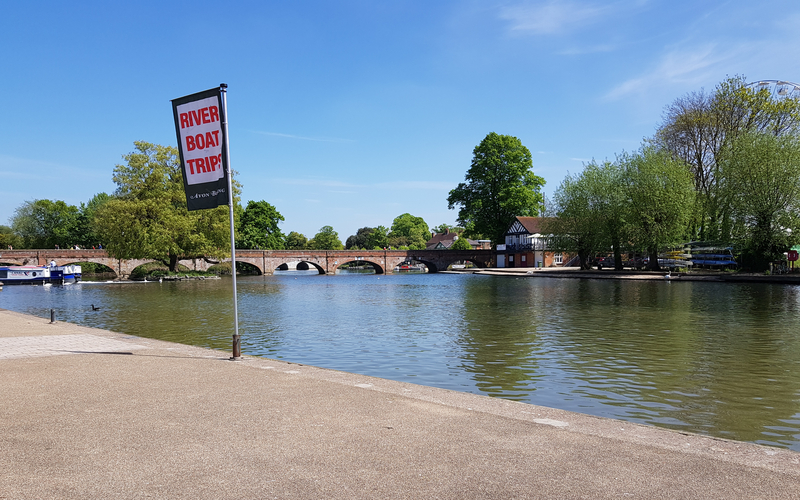 It has to be said; Riverside is now my new favourite site, and I’m extremely pleased it is only 12 miles away, as I’m sure we will be returning on a reasonably regular basis. The site is clean, well maintained, and the both the location and the facilities make it a really outstanding place to take a break. Washroom facilities, whilst a little dated, are of a reasonably high standard, and more than adequate for purpose. 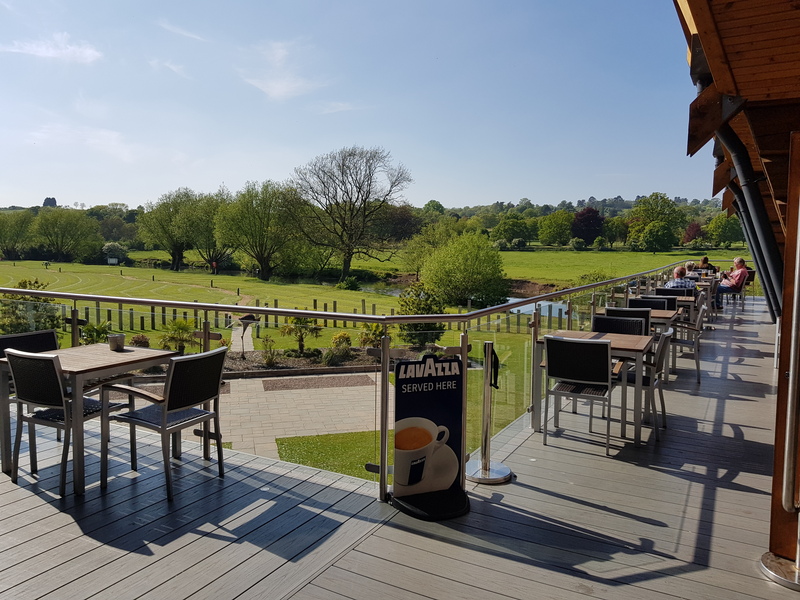 The Riverside Bar and Restaurant means you don’t have to venture too far, for something decent to eat, but, if you do decide to wander off site, then both Tiddington and Stratford Upon Avon are just a few minutes away on foot or by water taxi. If I’m honest, I’m struggling to find anything negative to say about this site. When we stayed there, the cost, for two of us, on a riverside pitch, with no awning (an additional cost of £2.50 per night) it came to £26 per night, which is far from being the most expensive site I have, ever, stayed on. If you want to check out the main Riverside Caravan Park web site, take a look here. To take a look at a quick promotional video of the site, click here. Many of us will be looking at increased car tax, on any new vehicles we buy, when the proposed new changes to Vehicle Excise Duty kick in on 1 April 2017. In fact, current estimates are that 70% of new car owners will be paying more than they would have done under the original scheme. Some of you may be surprised to know (others, less so) that those hardest hit will be the lower emission models, who’s green credentials have, until now, kept car tax rates to a bare minimum. OK, so we know a change is coming, but how, exactly, does it affect us? Firstly, it’s worth pointing out that these changes only affect those cars first registered on, or after, 1 April 2017. Cars owned prior to that will continue to be taxed under the old regime. Currently, all vehicles are taxed on a relatively straight forward basis. We pay an annual car tax, based on the emissions of our chosen vehicle, with all vehicles under 99g/km of emissions being tax exempt. I’m sure it will come as no surprise to many that the new system is due to be a little more complicated, and will be based on a three tier system, with different Vehicle Excise Duty (VED) rates for year one, as opposed to subsequent years. Thus, the current 13 band system will be replaced with a new 3 tier system, classified, simply, as; zero, standard and premium. The zero band will, now, only apply to those cars which, actually, have zero emissions. Premium will apply to all cars (even those with zero emissions) costing more than £40,000, and standard will apply to everything in between. * Cars over £40,000 pay a further £310 supplement for five years. So what does this all mean, for the majority of us? Well, as mentioned above, some 70% of drivers are expected to be worse off, under the new system. The vast majority of these, however, are going to be those who drive what were, traditionally, considered to be eco friendly vehicles. For those of us that tow, however, these new changes are likely to work in our favour. This is because, once we get beyond the first year for any sub £40,000 car, we will be looking at a flat rate of £140 per year. For any cars with emissions of between 1 and 99 g/km this will represent an increase of £140 per year, however, for those of us with larger cars, and 4 x 4s, more commonly associated with towing, £140 is likely to represent a not insignificant saving on the current system. Zero emission cars will continue to attract no VED, unless they cost in excess of £40,000. If they do, then even a pure electric car will still attract the £310 surcharge for the first five years. This gives us the somewhat illogical scenario that a £39,000 car, with ultra high emissions, of say, 250g/km will cost £140 a year (after year 1) to tax, whilst a £41,000 all electric car will cost £450 a year, for the first five years (£140, plus £310 supplement). Not a popular choice with the green fraternity, but a far more popular one with those of us who love to tow. Who would have thought it?